The Growing Kitchen is committed to preparing our products by the most ethical, sustainable, and organic practices possible. We are proud to grow our own cannabis and cherish our role as an environmental leader. Putting people and planet before profit to make a better product. We don't cut corners when it comes to sustainability, health, and safety, because we know high-quality practices mean high-quality products. Growing our own marijuana is central to The Growing Kitchen's mission of providing the highest-quality cannabis experience available. We raise all of our own plants by organic methods in indoor hydroponic and outdoor soil gardens on the outskirts of Boulder, Colorado. We believe the extra time and effort it takes to grow our own cannabis allows us to produce a better product as well as to protect the health of our land. Cultivating our own genetics ensures that our cannabis is grown as organically as possible and that it provides the same effect from batch to batch. Because we grow all our own cannabis, we are able to utilize the benefits of the full marijuana plant in our extraction processes. Most consumables are made using trim, marijuana leaves that have been trimmed from the more-potent bud of the plant. We have seen that including the full cannabis flower in our extraction process makes a vast difference in the quality of product, providing a more enjoyable, healthful, and therapeutic experience for our customers. Additionally, whole-flower cannabis features a broader profile of terpenes and cannabinoids than trim. The Growing Kitchen utilizes the most consistent and effective extraction methods available to create our products. Whereas most marijuana-infused products are produced using clarified butter, we rely only on concentrated hash oil to make our consumables. Unlike butter, hash oil remains the same potency over time, ensuring that no matter when our products were produced, they can be relied upon to maintain a consistent level of active THC. Using concentrated oil also allows us to offer dairy-free options. 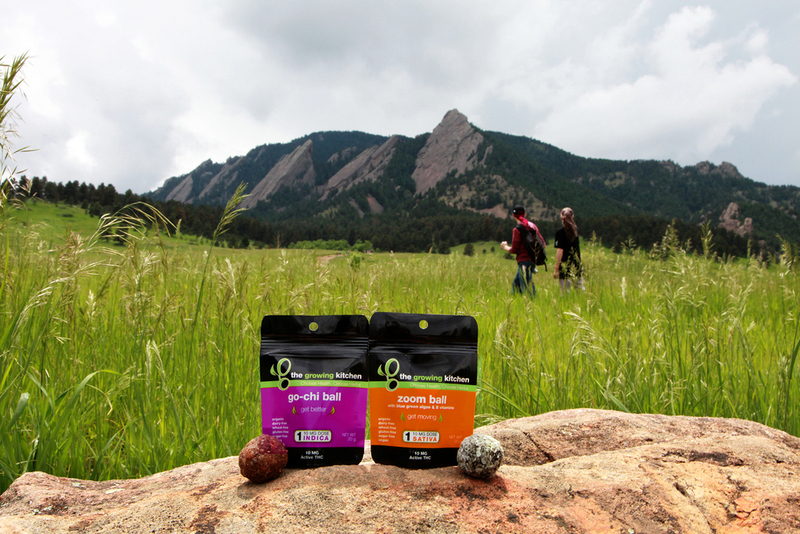 Our commitment to high-quality, organic, local ingredients goes beyond just cannabis plants. We carefully source the each component of our products from a trusted provider to ensure that everything we make is healthy, fresh, and natural. And because we believe in bringing the benefits of cannabis to all, we specialize in creating marijuana-infused consumables that are healthful and accessible to everyone, including a variety of gluten-free, dairy-free, sugar-free, raw, and vegan products. Even The Denver Post agrees, The Growing Kitchen has the most reliable active THC labeling in the industry. Our full line is comprehensively tested by Rm3 Labs in Boulder, Colorado and Gobi Analytical in Wheat Ridge, Colorado to ensure the highest level of consistency possible. We are proud that our customers can trust our products to provide a safe, comfortable cannabis experience. Our primary focus is to manufacture consumables that can be enjoyed in full, while also providing a safe dose of active THC.